Where can I check my ASDA giftcard balance? You can check the balance on your ASDA giftcard at any time online by clicking here and entering the card number and PIN on the ASDA site. You can also check the balance on your ASDA giftcard at any ASDA store, either by presenting it at the till or by taking it to the customer services desk. Where can I buy an ASDA giftcard from? As you would expect, ASDA giftcards are available in all ASDA stores. ASDA do not sell them online. Unusually, none of the regular gift card suppliers sell them either. You can often find ASDA giftcards cheaper than their face value from Zeek. 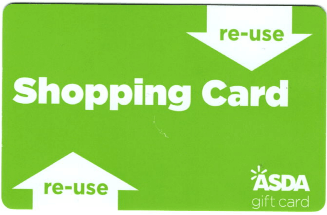 You can top-up your ASDA giftcard at the till in any ASDA store. ASDA stores are only permitted to sell you £1500 worth of giftcards, or 10 separate giftcards, whichever is higher, at one time. Where can I spend my ASDA giftcard? You can spend the cards in-store at ASDA but not with any of ASDA’s online services. The cards can be used to purchase anything in-store with the exception of lottery tickets and scratchcards. They cannot be used at ASDA petrol stations. ASDA concessions, such as in-store travel agents or dry cleaners, do not accept ASDA gift cards. Anything else I should know about ASDA giftcards? The ASDA giftcard will expire 24 months after the last transaction made on the card. This includes checking the balance, and also the initial giftcard purchase, making a transaction at a till or ‘topping the card up’ at an ASDA till. Cards may only be topped up in store and cannot be topped up online. If you want several ASDA giftcards, note that ASDA stores are only permitted to sell you £1500 worth of giftcards, or 10 separate giftcards, whichever is higher, at one time.